I hereby challenge Glycerin, Alex and Joel to a Blog-Off! My choice is the second Adagio from the Elgar Cello Concerto by Jacqueline du Pre. 1. The Cello is pretty heated. I know my make out partner prefers it to all other instruments and it is pretty hard to argue about the sultryness of a stinged instrument that is right in between a baritone and an alto. It is part Kathleen Turner and part Dimitri Hvorotovsky. 2. 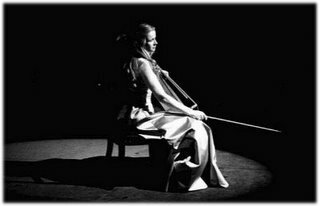 As far as the cello goes, I don't think there has been anyone who plays more passionately than Jacqueline du Pre. She attacked that thing with Anglo Saxon fire. 3. Speaking of Britain, they don't get enough cred for their Timberlake style ways. Supposedly Elgar wrote this piece about World War I. It doesn't sound that way to me. "it is pretty hard to argue about the sultryness of a stinged instrument that is right in between a baritone and an alto." that's not the only thing it's between! Quite nice. Thanks. I'd never heard that before, but what's with the fools waiting for the quietest moment to cough (near the end)? Peasants. Cat Power - The Greatest Do You Like This?